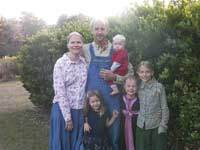 Dennis and Alicia Stoltzfoos and their children – (from left) Stella, Daniel (in Dennis’s arms), Caroline and Lily – milk 20 cows and 10 goats, along with raising chickens for meat and eggs, plus pigs, sheep and beef near the small community of Live Oak, Fla. The Stoltzfooses sell their Full Circle Farms’ products directly to consumers. An especially popular item is the raw milk, which Florida law allows as long as it’s sold as pet food. Pasture grasses in northern Florida die back in November and December. The grazing seasons starts again in March. LIVE OAK. Fla. - Dairyman Dennis Stoltzfoos believes the old saying, "You are what you eat" to be true. Dennis and his wife, Alicia, and children - Lily, Caroline, Stella and Daniel - milk 20 cows and 10 goats on their farm near Live Oak, Fla., about 40 minutes south of the Georgia state line. Dennis grew up on a conventional farm in Pennsylvania, but is farming unconventionally today. Born and raised an Amish Mennonite, Dennis left the Keystone State and his family's 100-cow farm for Florida in 1989, following the lead of an older brother. At first, Dennis did not farm, but pursued other interests. "I was in the alternative health field, and Florida was as good as Pennsylvania," Dennis said. "Lancaster County, where I grew up, was getting quite commercialized with tourist traffic and everything." During his 10 years providing alternative health care, he did "various and sundry things," including blood analysis and personal consulting. "Through it all, I came to the conclusion that we really are what we eat. So 10 years ago, we leased a small farm and returned, sort of, to my roots. But in a different way," Dennis said. Besides the cows and goats, the family has Angus beef cows, plus sheep and chickens. They sell meat and eggs directly to consumers. But the heart of their business is milk: raw milk. Florida allows the sale of raw, or unpasteurized, milk, as long as it's sold for pet food, Dennis explained. But what if people take the raw milk home and use in cooking or drink it themselves? "That doesn't matter," Dennis said. "The department of ag told me pretty much it's no skin off their teeth if people go home and eat pet food." "They said that's not their responsibility," the dairyman continued. "Their responsibility is food for human consumption and to assure a safe food supply. If people want to buy pet food and drink it, they said, that's their business." Milking 20 cows and 10 goats isn't for everyone. But Dennis said that size farm is fine for his family and his location. "We're pleased with it," he said. "I'm not going to tell anyone what to do. For our system, it works. It's not going to work for most people." The comparatively high price that raw milk commands is a major factor. "If you're going to get $2 a gallon or less for your milk at the farm, you've got to milk Holsteins and produce a lot of milk, to survive. But we get $13 a gallon (about $151 per hundredweight), so we're not into producing numbers of gallons. We're into producing nutrient-dense food, and people are paying us a high price for that." Dennis figures it costs him $7 to $8 to produce a gallon of milk, and his profit margin is $5 to $6 per gallon. With a gallon of milk weighing 8.6 pounds, that works out to $58 to $69 profit per hundredweight. Just what is it about raw milk that attracts some folks? "I grew up on raw milk, being on a dairy farm," Dennis said. "Millions of people drink raw milk. I haven't had any cavities to date, and I'm 48 years old. I attribute that to the available calcium in the milk." Dennis said many of his customers have told him their health improved after they switched to raw milk. But, he noted, "We're not just saying, 'Drink a gallon of raw milk a week and your ills will be cured.' We're teaching people how to change their entire diet and life-style. And we're producing the food for people to do that." He said he doesn't necessarily believe or not believe some the powers attributed to unpasteurized milk. "I just take it all with a grain of salt and produce more of it," he said. "There's always more demand. We did $300,000 gross last year, after starting 10 years ago with just one cow." Some people pick up milk, cottage cheese, lamb, chicken, beef, eggs and other food right at the Stoltzfooses' Full Circle Farm. But most of the farm's products are delivered by truck to major cities. "Meet up" places are posted on the internet. "We don't advertise, so our business is word of mouth," Dennis said. "Some people find us on the website, searching for raw milk or something else." Full Circle Farm is not certified organic, Dennis said, but "way beyond organic. We are way beyond the organic standards." His farm, Dennis said, uses "no chemicals of any kind, including antibiotics and hormones." For example, he said the national organic standards let farmers use Ivermectin to deworm cattle once in their lifetime. But Dennis refuses to use the product even once. "That's against every moral fiber of my being," he said. "I can't do that." The farm consists of 60 acres owned and 120 leased. The land is rolling and has quite a long growing season. 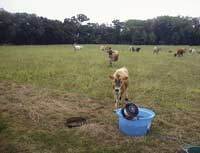 All the livestock is on grass as much as possible, with dry hay fed during November and December, after frost has killed the warm-season grasses. To improve the quality of the cows' milk, Dennis has been trying a bit of crossbreeding. He has a Milking Devon bull that's about the same size as a Jersey, but a darker red. Milking Devon, he said, is a "heritage" breed that can be difficult to find. Dennis' bull is a carrier of the genetics for A-2 milk. "It's a beta casein thing," he said. "The modern cow goes more to A-1 milk, and it's said to be a little less healthy. The A-2 milk, I liken it to an heirloom vegetable. So we're turning back to an heirloom, or traditional, animal." So far, Dennis is milking five Jersey-Devon crosses. The Devon is a dual-purpose breed, so he's using that bull on his Angus cows, too. "We sell freezer beef - about 50 head a year," Dennis said. "It's a big part of our business. The other part is milk, so the Milking Devon seems like the perfect breed for us." A true dairyman, Dennis is fond of good cheese. He sells about 100 pounds of "very fine aged cheese, 100 percent grass fed" from a longtime organic farm in Pennsylvania. "I just wouldn't want to be without my Pennsylvania cheese," Dennis said. "It's really good." His part of northern Florida is "in the boonies," according to Dennis. It's farm country - not the typical Florida image of Disney World, he said. Nor is his home area like another Florida stereotypical image: the Everglades. "We're a little bit too far north for alligators to get too big," he said. "Too cold in the winter, you know." Florida has just 130 dairy farms, according to Dennis. And many of them are larger than his, with 12,000 cows per herd to be "common." Everything Full Circle Farm sells goes directly to consumers. That creates a bit of stress for him, but it has its good points. Said Dennis, "It's a purposeful way of life. People depend on us. We have a direct connection to the consumers. The farm I was raised on - we had an idea that we were producing food. But we were very far removed from the consumer. Now we look people in the eye. Customers come right here, or we get on the delivery truck and go see 'em. We've built a relationship with our customers." Dennis obviously likes his way of marketing his farm's food. He said, "I like to say I'm customer inspected instead of government inspected." Asked why he left the Amish Mennonite church, Dennis said, "It's a long story. But I guess you come to the age of the early twenties and you realize there are some questions they don't answer, other than, 'That's the way we've always done it.' That wasn't good enough for me, I guess. "I certainly didn't leave Christianity," Dennis added. "I believe the Amish and Mennonites have a lot of good things going for them, but I just chose not to be one." As for his farm's name, Dennis said, "Life has a lot of full circles. I never thought I'd come back to farming. But, sure enough, here I am."